I made this silly little thing last summer… then I lost the pictures (well, THE picture) of the how to, but finally I found it again. It was where it has always been. At swapparties you can find pretty interesting stuff. 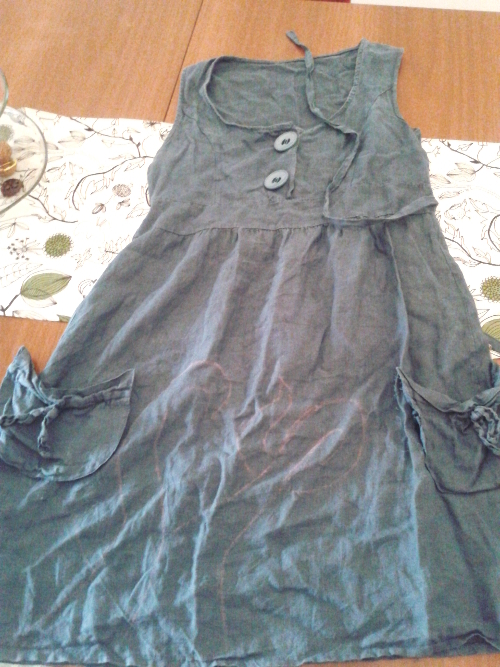 Like this linen, teal dress. Not bad, it just needed a boost. I had recently seen a picture of a beautiful steampunk dress, grey, with huge gears on the skirt. Since I’m not a mere copycat, I like to take inspiration and add something mine, and since blue is more abyss than clockwork, choosing tentacles really wasn’t hard. Plus I had just the perfect four little buttons. So, here’s all you need to know. 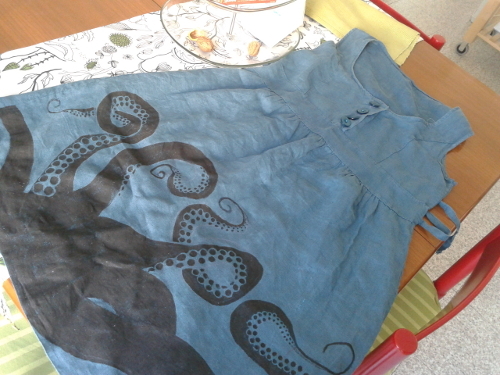 As you can tell by the picture I remember to snap halfway through, I detached the pockets (with a seam ripper), and drew some tentacles freehand. It’s easy, trust me, you only need to start with a wavy line that ends in a spiral curl. Then, starting back from the centre of your spiral, draw another wavy line that gets wider as you reach the bottom of the tentacle. And there you have your guidelines. Then start painting from the suckers (yeah, paint those suckers away! ), use the back of the handle of your brush, it will help you drawing smaller and bigger dots, you’ll be more in control this way. They will be smaller at the top and larger at the bottom. This way you’ll also be able to decide which way your tentacles are turning and wiggling (and if you get something wrong you’ll be able to paint over it later). Then fill in the tentacles. 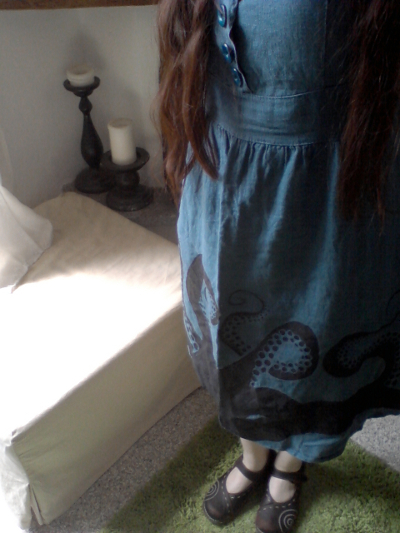 Spiral shoes are a plus, tentacle hair are thanx to sleeping with a braid and avoiding brushing before the picture. 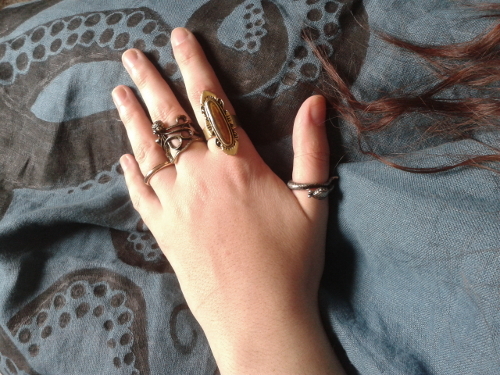 Then, for some more steampunk flavor, just add a ton of rings on your hands. Possibly with an octopus one. After that, all you’ll need to do is going around screaming “RELEASE THE KRAKEN!! !” or “Ph’nglui mglw’nafh Cthulhu R’lyeh wgah’nagl fhtagn” (but I pronounce the first one better).